The wadi Hilmi provided a good supply of water (traces of ancient falaj system can still be seen) but there was almost no agricultural land nearby and all the food supply had to come from the interior (according to Albuquerque) or through trade by sea (according to Marco Polo and Ibn Battuta). This is a situation similar to Hormuz Island’s city. Trade was clearly the unique raison d’être of Qalhat. 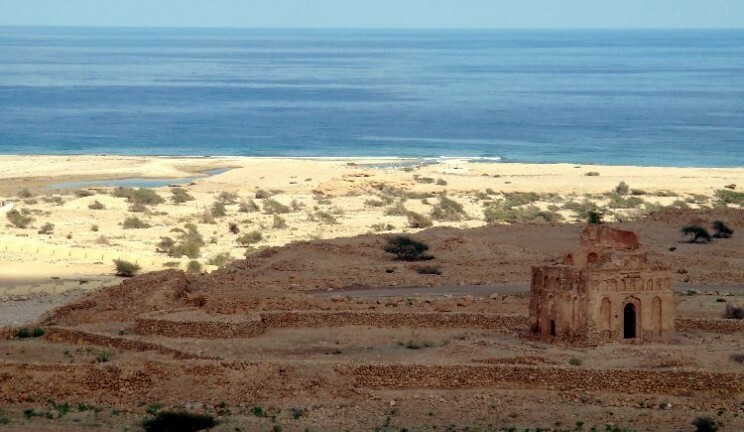 Today, the ruins occupy a very large area on the east bank of a wadi (stream) which opens into the khor of Qalhat, after crossing the mountains through narrow gorges. The ruins still cover more than sixty acres. The city was triangular in plan and its fortification walls can still be seen along the bank of the wadi to the northwest, and towards the mountain to the southwest, where it is preserved on one to two meters high. The (site’s) western corner where the mausoleum stands was separated from the rest of the town by a dividing wall. 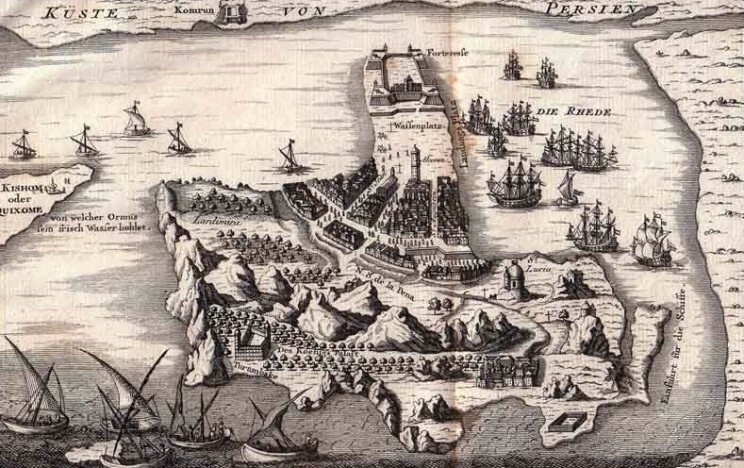 To the south, a second wall from the seashore to the summit of the heights protected the access along the coast. It seems that the area between this wall and the city itself was only loosely settled. Qalhat had always been considered as an excellent stronghold in ancient times. Extensive ruins of what were houses and warehouses can still be seen within the walled area close to the coast. The ruins have been reduced to heaps of stones with no standing walls. The ground at the site is littered with a multitude of sherds, including imported Persian and Chinese wares. The only standing structure is built in a style reminiscent of a Sassanian era chahr-taqi fire temples. 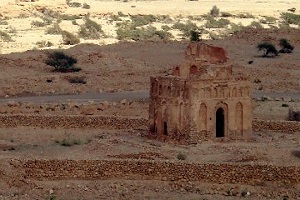 The name ascribed to it, Bibi Maryam, is similar to the name given the the only standing structure in Minab: Bibi Minoo. 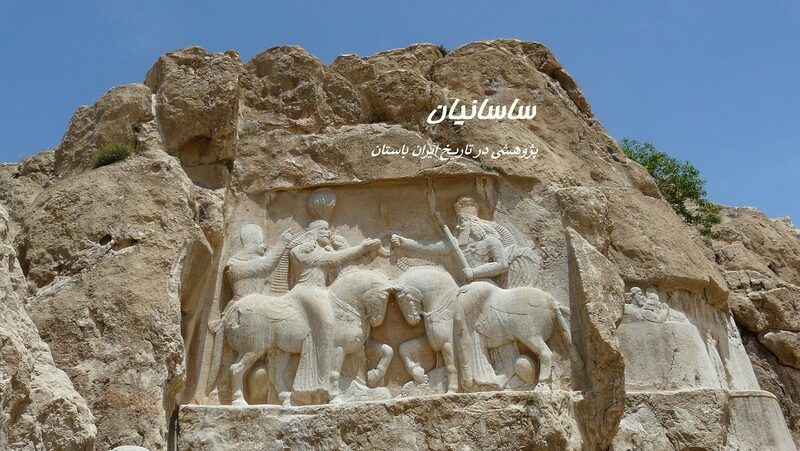 It is quite possible that the original structures of Qalhat harken back to the Zoroastrian era, and that after the advent of the Islamic era, were then adapted, remodelled and given new names as is the case with several old Zoroastrian structures in Iran.